This month, Curtis Turner’s column in The Highland Woodturner focuses on a simple but functional project: a mallet. This handy project is fast-paced and has a wide range of acceptable designs, so it’s perfect for a beginning turner. This project will take a beginner about 2 hours to complete. A mallet also makes a great gift for a woodworking friend. Ready to try turning a mallet? CLICK HERE to read more! 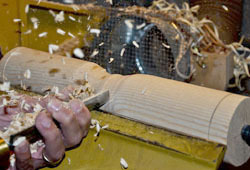 Take a look at the rest of this month’s Highland Woodturner by CLICKING HERE! The Highland Woodturner: Check out the September Edition! The Stanley Sweetheart Hand Tool Giveaway: Interview with the Winner!